The swarming crowds on Miyajima Island don’t climb the hill behind Itsukushima Temple. Thankfully. They’re mesmerised by the temple itself which seems to float on water at high tide. 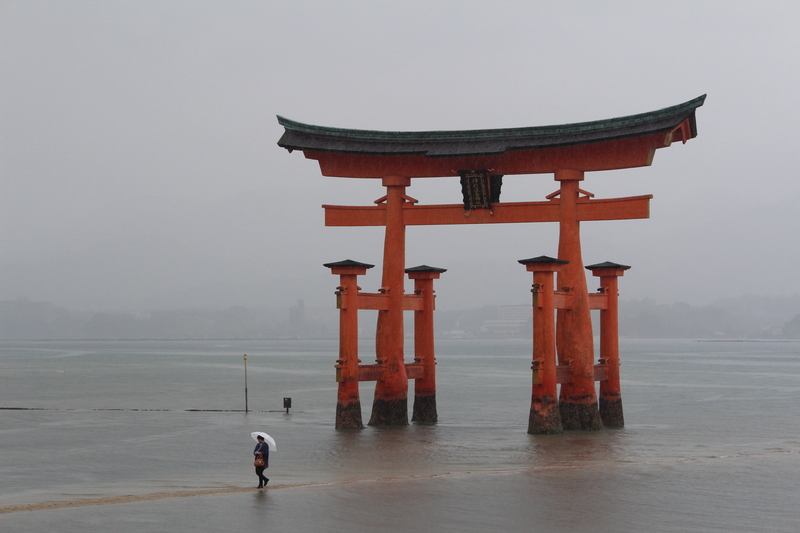 From the boardwalks they have an amazing view of the famous Torii gate out in the bay. The more adventurous tourist climbs the mountain. 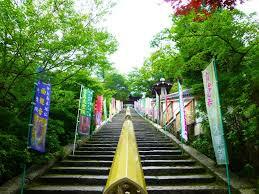 If they stop halfway up at the Daisho-in Temple they would probably head up the wide stairway to the pagoda. 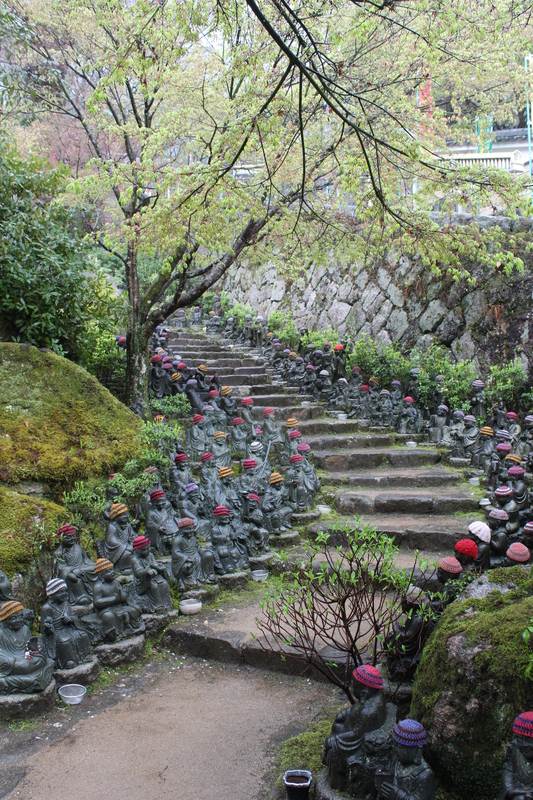 However, if they took a little hidden path on the left of the entrance gate, into a pretty garden of greenery, cherry trees and moss, and meander up steep small stone steps, they would discover the magical world of 500 buddhas. I’m the only person in the garden at first. It’s cold and has just stopped raining. 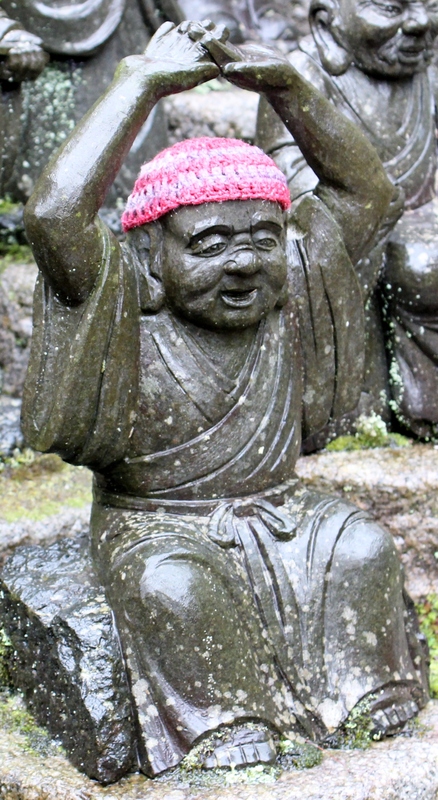 The Buddhas wear little crocheted beanies to keep them warm, I’m sure. They watch me climb the steps. One little guy cheers when he sees me. Another glances at me shyly. I do a double take on one who looks just like my father. Every single one of those 500 Buddhas has a unique face. And an exclusive personality that shines through so strongly they seem like real people. It’s like I’m meeting all these new friends for the first time. I immediately warm to some and stop to talk. I tenderly pick a brown leaf off someone’s nose. A few I glance at warily and keep my distance. When I stand in front of the shrine at the top of the hill I bow my head. I pray for just a little of that ability to create such distinct individual characters as skilfully in my writing. 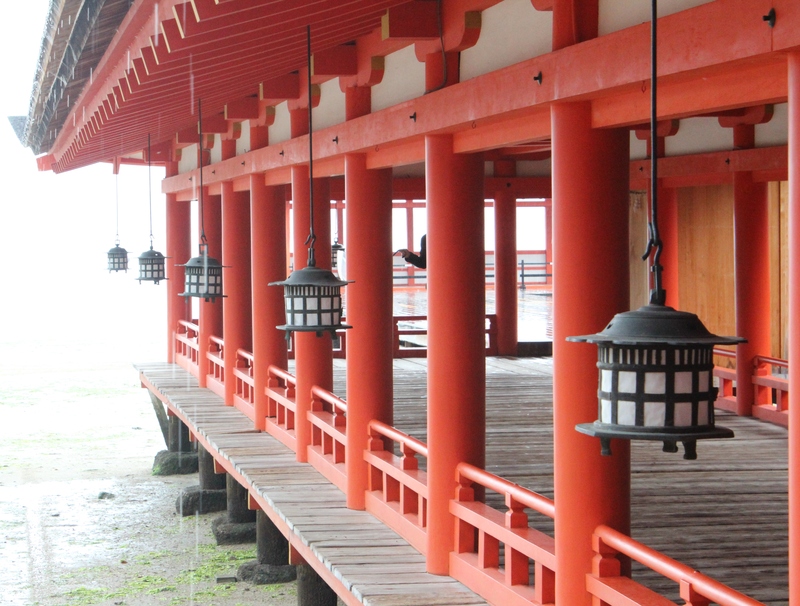 This entry was posted in Travel, Uncategorized and tagged 500 Buddhas, character, Daisho-in, Japan, Miyajima, travel, travel writing, writing. Bookmark the permalink. Oh, yes! What a beautiful striking image. I’ll never visit the 500, but I feel I’ve now seen it through your sensitive writer’s eyes. I was with you discovering the faces, the implied characters … such authentic lyrical writing, Karen. Thank you. Anne, this is one of the places that touched me most in my travels. I’m pleased I could give you a little taste of it. I kept thinking of the thousands of tourist crammed into the temple on the water while I was in peaceful solitude with the Buddhas. I appreciate your kind comment. How exquisite: the writing, the images and the garden with the 500 Buddhas. 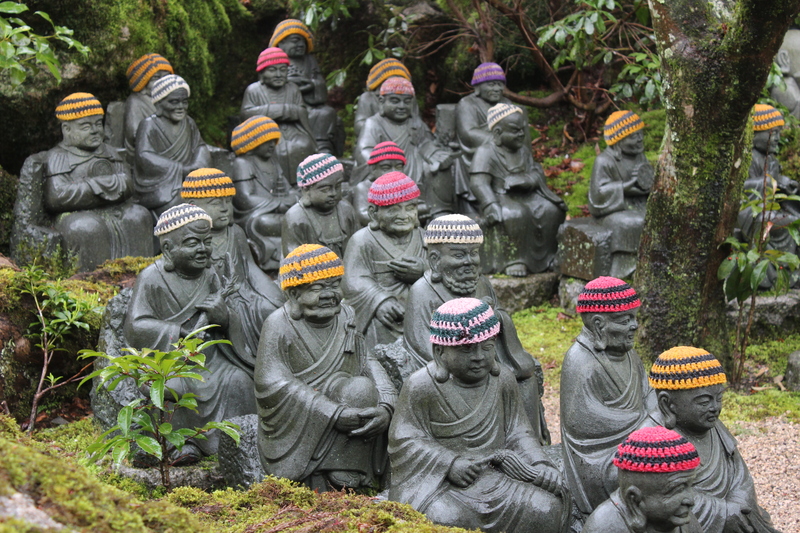 A very unique place to visit, even without the fabulous beanies. Like Anne, I doubt I shall ever have the opportunity to go there, so thanks so much for sharing, Karen. It is an exquisite place, Diana. I’m thrilled to share it with you. Aren’t those beanies fabulous! I laughed out loud when I saw them and then felt terrible. But by the time I got to the top of the steps (an hour later – I couldn’t bear to leave) I’m sure the Buddhas were laughing with me. That last shot is a cracker. Ohhhhhh I’d be so tempted to poach one of those beanies! I loved the beanies, too. 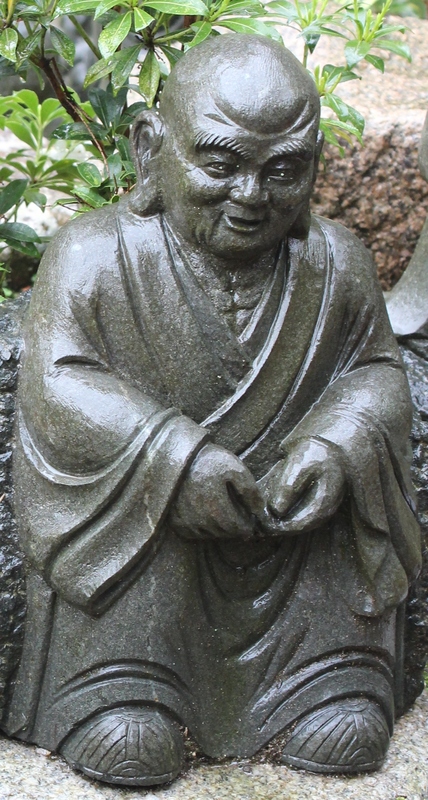 Someone told me that people who have lost children often look after the Buddhas as if they were their children. So in winter they crochet hats and scarfs for them to keep them warm. Thanks very much for visiting and for following my blog. I’ll happily accept that word, Joanna. There’s even a narrow open gate you go through into the garden. If I wasn’t one of those people who peek through slits in fences, and always wonder what’s behind walls, it would have been very easy to miss the gate. Only 3 people came into the garden in the hour I was there. Less travelled indeed! What an incredible place, beautifully shared! It is a magical place, Dawn. I’m glad to share it with you.